Stepmom, are you seeking reassurance for a weary soul? Would you like to experience peace, power and purpose in your everyday life? 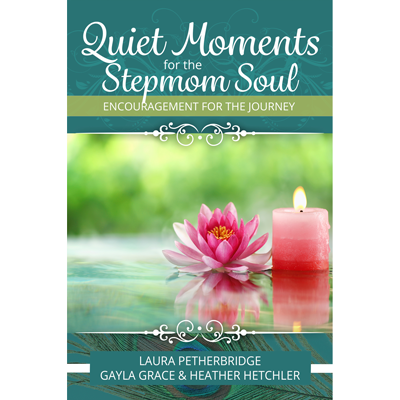 In this devotional, Quiet Moments for the Stepmom Soul, three seasoned stepmoms provide 90 days of encouragement, comfort and insight. Cozy up and relax as Laura, Gayla and Heather provide a soothing salve and renewed enthusiasm for today’s stepmoms. Bolster your confidence in a loving God. Pray with fervency for your family. Wish you had a support group of stepmoms you could call for encouragement, wisdom, and strength when you need it most? Most stepmoms do. Sitting and talking with trusted friends is ideal, but if you don’t have that this book is the next best thing. Quiet Moments for the Stepmom Soul is your virtual support group with trusted friends. So, grab a cup of coffee and let Gayla, Heather, and Laura share their hearts with you.